I Love Read Aloud Thursday. (That needs to be the next button that Amy creates. Ha!) I plan ahead for them which means I think through what I want to read with my son. It gives us purposeful reading time together which we both enjoy. It gives us a chance to explore things I might have previously thought were too far above his reading level - and then I delightfully discover (time and time again) that that is not the case. What's NOT to love about Read Aloud Thursdays? 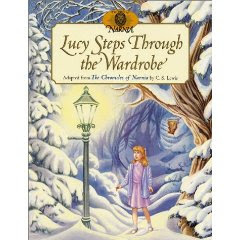 For the next two weeks we'll be focusing on The Chronicles of Narnia, in conjunction with the Chronicles of Narnia Reading Challenge that I'm hosting here at Reading to Know. I love Narnia and I hope to see my son grow to love it also. At age 2 1/2 I wasn't sure how much I should expose him to just yet. After all, it's hard to explain dwarfs, elves and white witches. The concept that there is a battle between good and evil hasn't really sunk in to yet and I don't want to give him too much information before he's ready to properly deal with things like that. Still, I hope to make him familiar with the stories and characters and present this particular series by C.S. Lewis in a way that is fun and exciting. Now. For a fun little giveaway. (And it is little, but it is also fun!) I was at Goodwill the other day and I found two "brand new" (i.e, still in the package) Mr. Tumnus McDonald's Happy Meal Toys. I bought both, of course, and Bookworm 1 has been playing with the little Mr. Tumnus (who is also a whistle! oh yay) and the little diarama that comes with him. Like I said, I bought two which means I have a spare Mr. Tumnus to give away if one of you would like to win him. He's still in the plastic wrapping package that he came in and it comes with his home (which pictures Lucy sitting in the chair). 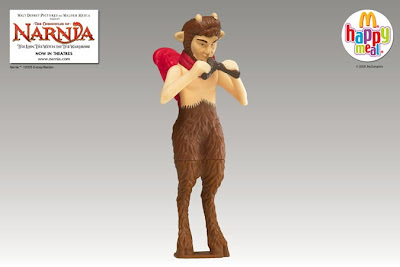 If your kids might like some fun play, well then - here's Mr. Tumnus. To win? Leave a comment below (U.S. Residents only please). You don't have to be a participant in the Narnia Reading Challenge to win. The contest will run until next Thursday (July 2nd) at which point I'll have another children's Narnia giveaway. So stay tuned. I don't particularly need or want a Tumnus toy--but I'm loving that you're introducing your son to Lewis early. My mom read The Lion, the Witch, and the Wardrobe to us out loud when my sister was in first grade, I was in kindergarten and my next younger brother was 3 or 4. 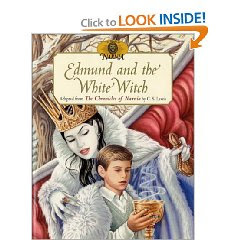 We all did just fine until Edmund was stuck in the White Witch's castle--that's when Joshua started having a really hard time with it. He was a really empathetic little guy and that part of the story was just too much. I love this idea! I've fallen off the wagon as far as reading aloud and I think that's largely because I'm extremely tired of all our board books and little-little-kid books. My oldest is almost 3 but my middle is only 1 1/2 (and youngest is 2 mos but he sleeps through it!) so I'm trying to keep them both interested. I think I might try a kid's version of Narnia; don't have one on hand, but I -heart- my local library so I'll get it there. In the meantime... I'll find something else and we'll have read aloud time today. Thanks for reminding me to include this precious time in our lives. I want my children to grow up loving stories and books. I was worried about exposing our boys to battles and fast paced story lines that involved good and evil and life and death, but I must say they are even more blood thirsty then I thought! They absolutely love the battle sequences in Narnia, they love that they can count on Aslan to be ruler and they love the brothers and sisters who fight together. They were quite forgiving of Edmund and even remarked that we all make mistakes and family should always forgive each other! Tavis commented the other day that when our Chinese baby is older they can all play Narnia together because they need two boys and two girls. I found this comment a little amazing because our plans for adoption are quite a ways down the road and we do not often talk about it with the kids. They sure file away information! For some reason Mr Tumnus was hard for them to get used to but they found the centaurs believable! My kids often surprise me with how well they can handle some things I would expect to scare them. We don't need the Mr Tumnus, but I love that your little guy (Staples? Clive? Lewis?) is playing with him. Have a great Thursday, Carrie! What a great giveaway. I have been introducing my kids to CS Lewis early as I was also introduced early as a child. The books are such positive tales. Thanks for the chance to win. Oooohhhh! I just remembered that I have a Mr Beaver (from a happy meal) in a box somewhere. I'll have to dig it out. We also have a couple of the easy readers from Chick-fil-a, and they are very simple introductions to the story with pictures from the movie. I can't wait to read aloud the full stories to my kids!